What are CAT or CT scans? CAT or CT scans (computer-assisted tomography or simply computerized tomography), are specialized X-rays that produce cross-sectional images of the body. An X-ray-emitting device moves around the body region being examined. At the same time, an X-ray detecting device moves in the opposite direction on the other side of the body. As these two devices move, an X-ray beam passes through the body from hundreds of different angles. Since tissues and organs absorb X-rays differently, the intensity of X-rays reaching the detector varies from position to position. A computer records the measurements made by the X-ray detector and combines them mathematically. The result is a sectional image of the body that is viewed on a screen. 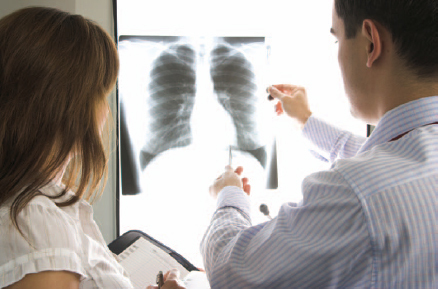 Using electromagnetic radiation known as X-rays, physicians can peer inside the human body to help them make diagnoses. © iStockphoto.com/Christopher Pattberg Fotodesign.